The best of the treatments for your health and the aesthetics! Mode A: according to the sequence of the program there will be an inflation and deflation of the boot one sector at a time, from the distal (foot or hand) toward the proximal part. Mode B: according to the sequence of the program there will be an inflation of two chambers at a time, simulating the function of the overlap boots. Mode C: the sequence of the program starts pressure from the feet and maintaining previous chambers inflated until the whole leg (or arm or abdomen) is inflated up to the groin. The pressotherapy is one of the most effective systems to favor a correct venous circulation, thanks to the sequences of inflation the venous return is stimulated and you decreases the muscular tensions. Besides the pressure allows the interstitial fluids in excess to flow in the circulatory system so that to be eliminated, favoring so the correct operation of the lymphatic system. 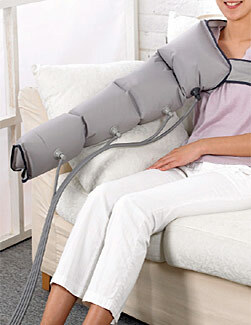 Very useful also in situations of swelling, of tiredness and fatigue of the limbs, it finds a valid employment antistress and relaxing.Thanks to the effect produced on the body, the treatment of pressotherapy is useful for therapeutic purposes and aesthetical (water retention and cellulitis) finality.